The 46-year-old rapper, also known as Diddy, is famous for the extravagant bashes he regularly hosts for his celebrity friends. As Diddy appeared on The Tonight Show Starring Jimmy Fallon on Thursday night (31Mar16), Jimmy recalled one invite he had received for a previous event hosted by the musician. "You sent me a self destructing invite once," Jimmy told Diddy to which he replied: "I remember, I'm very high concept!" Jimmy continued to tell the audience he had received the invite, which told him he had a certain time to write down the address for the party before it destructed. "I went to the party and it was one of the best parties I've ever been to," Jimmy continued. "I went in and it was just packed, and everyone was drinking and dancing and having a good time. You gave me a shout out - you would announce people who came into the party." 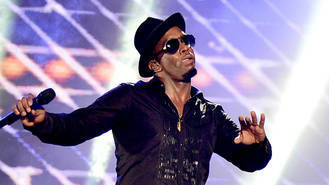 Diddy explained he takes his role as host very seriously, and is determined to make his parties as enjoyable for his guests as they are for him. "I have to give a shout out to pastor Noel Jones, Grace Jones' brother, that was his sermon this Sunday - I just sampled it! We gotta give so when you come to a Puff Daddy party I’m on the mic, I’m spreading the love, giving shout outs, I’m congratulating everybody on their hard work. Ciroc (vodka) is overflowing everywhere. People are dancing, bad boy music is playing - it’s the love." Diddy was in a cheery mood for the interview with Jimmy. Wearing his trademark sunglasses, the rapper told the audience that he's in a good place in his life right now. "You’ve got to work hard and you’ve got to play hard - you have to treat yourself," he smiled. "I’m filled with positivity; there are a lot of positive things going on in my life right now, in the air - that’s what a party is about, when you come to a Puff Daddy party."